Extending Financial Inclusion in Africa unveils the genesis and transformation of Africa’s financial sector and its ability to provide finance for all. 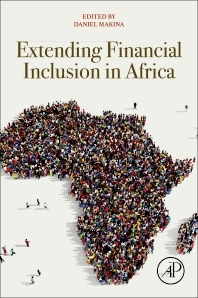 Contributors of the Book traverse the whole spectrum of African financial systems, examining their depth and breadth and empirically evaluating their appropriateness and effectiveness to achieve inclusive　financial services. 2. How Did Banks Evolve in Africa? 3. Financial Development in Africa: Is it demand-following or supply-leading? Daniel Makina is Professor of Finance at the University of South Africa. He holds a PhD from the University of Witwatersrand, Johannesburg and an MSc in Financial Economics from the University of London. His research interests are in banking, financial inclusion and migration financial economics and has published on these topics in reputed international journals such as Applied Financial Economics, Applied Economics, African Development Review, African Finance Journal, Migration Letters, International Migration, among others. He is co-author with Lawrence J. Gitman and others of the book Principles of Managerial Finance: Global and Southern African Perspectives. He also contributed the Chapter The Mortgage Market, Character and Trends in Africa to the International Encyclopaedia of Housing and Home. In 2017, he served as Guest Editor of the African Journal of Economic and Management Studies and won the Emerald Reviewer Literati Award.